With an assured drive at Silverstone, Jack Brabham recorded his fourth successive grand prix victory, the first man to achieve such a feat since Alberto Ascari in 1952. However, it was Graham Hill who caught the eye with an inspired drive that nearly ruined Brabham's day. Stirling Moss, still recovering from injuries sustained at Spa, had to be content with the job of starter for the day. Brabham was on pole in his Cooper Climax with Hill alongside him in the BRM. As the flag dropped, Hill stalled on the line for the second race in succession: "There was no excuse," he said later. "I was just plain stupid." 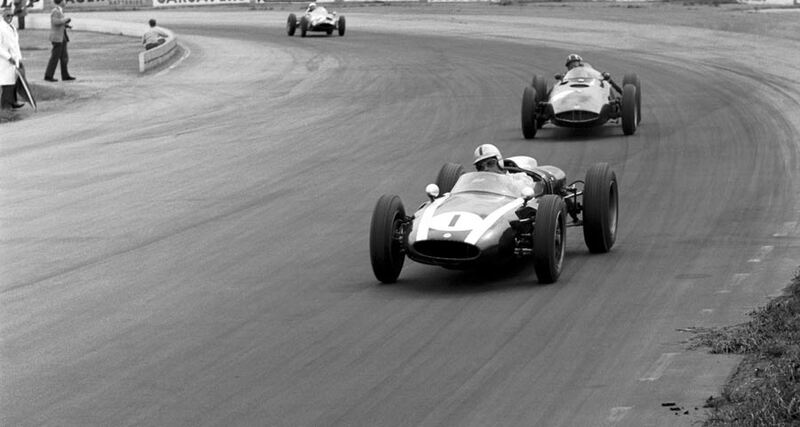 Brabham raced into a commanding lead, while Hill found himself down in 21st place, once he had got his car going. In a magnificent display of determination and superb driving, Hill carved his way through the field and was soon closing in on Brabham. By the 55th lap, Hill took the lead and kept ahead by one or two seconds. With five laps to go, he "began to experience a little brake trouble", and, as he approached Copse Corner, tried to overtake two tailenders. His brakes failed, the BRM spun and he ended up in a ditch. A relieved Brabham drove on to victory, which put him on top of the championship standings, five points ahead of team-mate Bruce McLaren, who finished fourth. Former motorcycle world champion John Surtees, driving a Lotus, finished in second place, a feat made all the more remarkable by the fact that it was only his second grand prix.